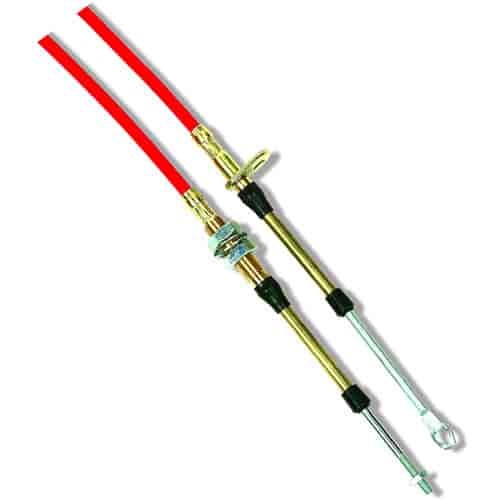 B&M Automatic Performance Shifter Cables are designed for smooth, long lasting operation and they are offered in a variety of lengths so suit your application. B&M Shifters built prior to 1981 will require a 6-foot cable with threads on both ends. Shifters built from 1981 to present require cables with eyelet on one end and threads on the other end. Most B&M shifters are packaged with a 5-foot cable (except race shifters). 80605 is rated 4.8 out of 5 by 5. Rated 5 out of 5 by 63comet from Great product My old cable had been on the car for about 10 years. The only reason I needed a new one was because my car was lowered so far the cable would scrape the ground often. It finally wore through at the worst timing as always. Wasn't sure which cable to buy so I emailed jegs, they replied within a few hours of the part number needed. New cable fit perfect and functions perfect. I made sure to tuck it up better so I won't need a third. Do I need anything special to attach this cable to my GM th400? Depending on your application you will need the appropriate clevis or bracket. what is the length of this cable in inches ? This 5' cable would be 60&quot; long.